"What is my trades' return?" Use the Profit and Loss tool to check profitability on existing trades or for estimating trade returns. P&L’s includes round turn commission cost. I am Long 200 shares of ABC stock which I bought for $10.00. My Target Price is $12.50. My comm. is $6.99. 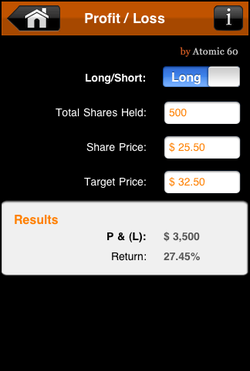 If ABC shares reach my Target of $12.50, I Profit $486.02 resulting in a 24.30% return. Nice! 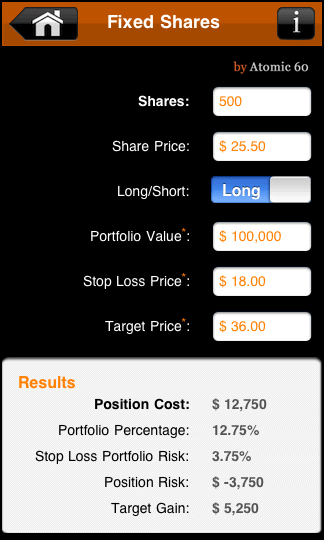 "The trading profit loss calculator app for stock, options and futures traders."